Note: Essential Geography of the USA images are from the 1st edition. 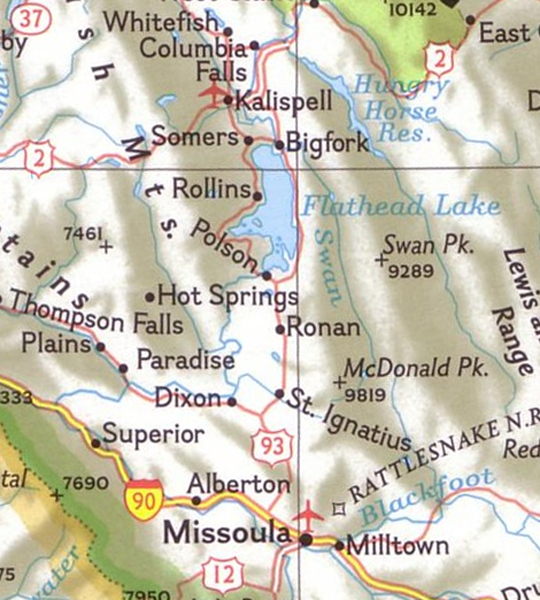 Until the publication of the Essential Geography of the USA, no map illustrated the physical arrangement of our major rivers, cities, forests, landmarks, etc. with enough depth and clarity to reveal the general patterns of US geography. In other words, we Americans did not have the most basic tool of geographic awareness and literacy - a general map of our own country. Below, comparisons with National Geographic's political map of the US - the map that for many generations set the standard for US wall maps - give you an inside look into how the Essential Geography of the USA sets a new standard for wall maps of the United States. 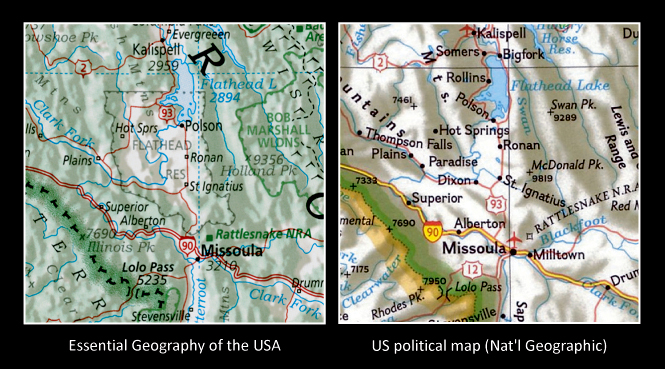 The comparisons show how the Essential Geography - the first and only general map of the US - illustrates basic geography with the depth, clarity - and fidelity - that a map must have if it is to serve as a useful tool for building basic geographic awareness and literacy. Situated at an elevation of around 840 feet in a mostly non-forested area of low relief within the Central Time Zone (you'll need the whole map to see time zone boundaries), Minneapolis, Saint Paul and surrounding suburban cities form one continuous urban area that straddles the confluence of the Minnesota and Mississippi Rivers. Several iconic landmarks; Mall of America, University of Minnesota, Fitzgerald Theater and an intercontinental airport also contribute to the unique geographic character of this place. National Geographic's US political map does not illustrate any of the basic geographic characteristics mentioned above. I use the principles of map legibility outlined by Swiss cartographer, Eduard Imhof (1895-1986), whom Arthur Robinson (1915-2004), the founder of professional cartography in the United States, called the "Dean of European cartographers." 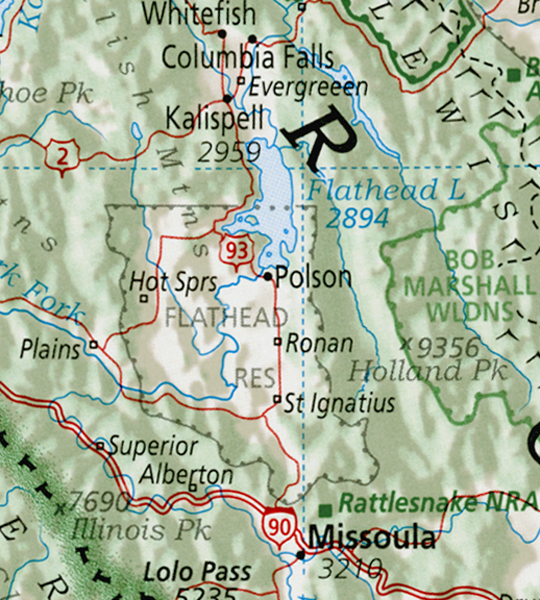 In 1965, Imhof wrote, "A map should contain nothing that an average user cannot easily see." Old-style US wall maps contain much that an average user cannot easily see. For example, on the National Geographic map above, the capital "B" of "Bloomington" obscures the red symbol that represents the Minneapolis-Saint Paul International Airport; and in places, the Mississippi River - the most important river in the United States - is not easy to see among state boundaries and roadways. It seems likely that a person will most successfully gain geographic inspiration and understanding from a map that makes basic geography, like airports and rivers, easy to see. For that reason, I tried to make everything on the Essential Geography clearly visible to the "average user." The ability to recognize and appreciate the unique geographic characteristics that distinguish one place or area from another is the essence of geographic understanding. 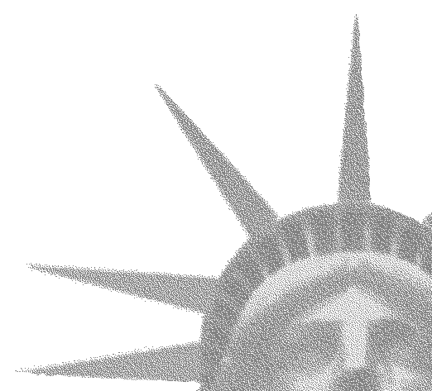 Population density is one of these distinguishing characteristics. 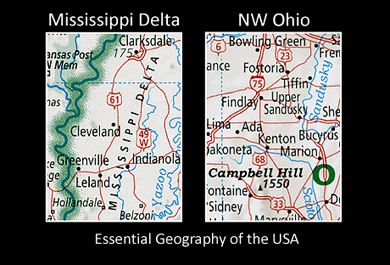 The Mississippi Delta, presented in two details below, has a population density of approx. 44 people per square mile. 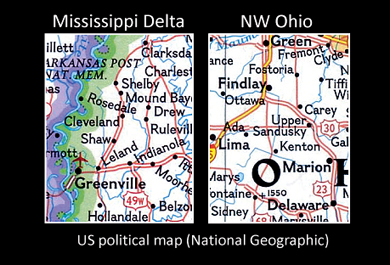 The part of NW Ohio detailed below, has a population density of approx. 104 people per square mile, or 2.3 times the population density of the Mississippi Delta. The Essential Geography represents only the principal cities and towns of a given area. The result is localized variations in place name density that reflect localized variations in population density, letting us accurately conclude, for instance, that the Mississippi Delta is less densely populated than the part of NW Ohio detailed here. Conversely, the roughly equal density of place names on National Geographic's US political map (below) could mislead you into believing these two areas have roughly the same population density. The Essential Geography looks a lot like the landscapes it represents. This bridges the conceptual gap between this map and reality, and establishes in the minds of its users that geography is the observation and appreciation of the real world. National Geographic's US wall map is more abstract. Until the publication of the Essential Geography of the USA, Americans lacked the most basic tool of geographic understanding, a general map of the place we call "home." By allowing us to visualize the basic layout of our country, the Essential Geography, the first and only general map of the United States, has the power to increase awareness and understanding of basic US geography, and help start a new tradition of geographic literacy in America.